>>>This DVD is encoded with Region 3. This DVD will NOT be viewable on DVD players made in the U.S.A., European countries or Japan unless they are code- (region-)free DVD players. To learn more about our DVD Region Code, please visit our info page and look for Info on DVD Region Code in Return Policy section. 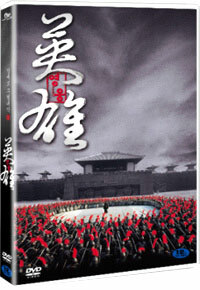 Hero is two-time Academy Award nominee Zhang Yimou's directorial attempt at exploring the concept of a Chinese hero.During the peak of their Warring States period, China was divided into seven kingdoms all fighting for supremacy. Most determined to dominate China was the Kingdom of Qin, whose King (Chen Daoming) was wholly obsessed with becoming the first emperor of China. Though he was an assassination target for many, none of his would-be-killers inspired as much fear as the legendary assassins Broken Sword (Tony Leung), Flying Snow (Maggie Cheung), and Sky (Donnie Yen). In hopes of thwarting his death, the King (Daoming) promised endless wealth and power to anyone who defeats his would-be murderers. No results come until ten years later, when a man called Nameless (Jet Li) brought the weapons of the three assassins to the Qin King's palace. Nameless claimed to be an expert swordsman who had defeated Sky and destroyed the famed duo of Flying Snow and Broken Sword by using their love for one another against them. Once Nameless comes face to face with the King, however, it looks as if the situation is more complicated than he had thought. Also featured in Hero is actress Zhang Ziyi (The Road Home) as Broken Sword's devoted servant, Moon. Highlighted by a pageant of breathtaking images, Zhang Yimou's exhilarating Hero is at once an epic historical tale, a rousing action movie, and an intimate romance. Comparisons to Crouching Tiger, Hidden Dragon will be inevitable for Western audiences, and while the two films share a similarly romantic take on the "wuxia" genre of gravity-defying, sword-wielding heroes, the faster-paced Hero has a harder edge and clearer focus. The brisk running time compresses what could have been a sprawling story into a lean narrative that rarely pauses for breath as it accelerates toward a gripping finale. Real emotion and passion is evoked through the powerful relationship between Broken Sword and Flying Snow (Tony Leung and Maggie Cheung), and even a minor character like Moon (Zhang Ziyi) has a memorable presence. The flashback structure, which finds Jet Li and Chen Daoming engaging in a storytelling tete-a-tete, is handled with such confidence that there's never any confusion as the story slips in and out of the past and present. Much of the credit for this goes to the film's amazing use of color, which not only distinguishes the various stories from one another but also serves as the underlying force behind the vibrant imagery. With its beautiful cinematography, dazzling combat sequences, and moving love story, Hero is the rare epic that manages to be intensely personal.